EVRYTHNG wins IoT Partner Ecosystem of the Year award from #IoTBreakthrough. “We're honored to be recognized as IoT Partner Ecosystem of the Year," said Niall Murphy, Co-founder and CEO, EVRYTHNG. "Together we're digitally activating products at mass scale to empower consumer brands with the data intelligence needed to compete and meet the needs of today's consumers." EVRYTHNG, the IoT platform that activates every consumer product to make it intelligent, interactive and trackable, today announced that it has been selected as the winner of the “IoT Partner Ecosystem of the Year” award from IoT Breakthrough, an independent organization that recognizes the top companies, technologies and products in the global Internet-of-Things (IoT) market. The mission of the IoT Breakthrough Awards program is to recognize the innovators, leaders and visionaries from around the globe in a range of IoT categories. This year’s program attracted more than 3,500 nominations from companies all over the world. 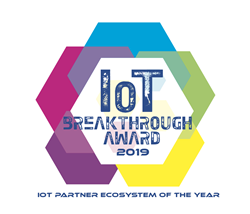 “EVRYTHNG represents the spirit of the IoT Breakthrough Awards perfectly, delivering an innovative approach and solution to help consumer product brands digitize individual products at mass scale,“ said James Johnson, managing director at IoT Breakthrough. “By building an IoT partner ecosystem to drive real-time insight and data intelligence throughout the production and distribution process, consumer goods companies are realizing massive benefits throughout the supply chain — from sourcing to the end-customer experience. Competing supply chain technologies and retail channels have created a giant blind spot for consumer product brands: they don’t always have a complete view of their products — geographically or in the product life-cycle. The new digital ecosystem -- created by EVRYTHNG in collaboration with some of the world’s largest supply chain and packaging companies -- is the first to employ the new GS1 Digital Link standard to digitally activate products at mass scale for consumer brands. As a result, consumer product brands are reclaiming control of both the supply chain and the customer relationship. “We are honored to be recognized for the IoT partner ecosystem we’ve created in partnership with packaging and supply chain giants – including Avery Dennison, WestRock, and Crown Packaging," said Niall Murphy, Co-founder and CEO, EVRYTHNG. "Building on our recent work with GS1 to roll-out the upgrade to the global barcode standard, EVRYTHNG and our partners are digitally activating products at mass scale and empowering consumer brands with the data intelligence needed to both compete and better meet the needs of today's consumer. The reality is brands face tremendous challenges being disconnected from their end-customers as their products move through the global supply chain." Digital activation with EVRYTHNG makes each product item interactive, intelligent and trackable on the Web, opening a new channel for trust and engagement between brands and their consumers, while providing full visibility into each product’s lifecycle. Through EVRYTHNG’s IoT partner ecosystem, consumer products are now #BornDigital, with digital identities embedded as they are made, making it easy for brands and retailers to rapidly deploy digitized products at mass scale. IoT Breakthrough, part of the Tech Breakthrough Awards organization, is devoted to honoring excellence in Internet-of-Things technologies, services, companies and products. The IoT Breakthrough Awards program provides a forum for public recognition around the achievements of IoT companies and products in categories including Connected Home and Home Automation, Connected Car, Industrial IoT (IIoT) and Smart City, Consumer IoT and more. For more information visit: http://www.IoTBreakthrough.com.